John Shuck is a white, middle-class, able-bodied, heterosexual man. The minister of Southminster Presbyterian Church in Beaverton said all of the aforementioned pieces of who he is "limits his vision." Shuck, he said, is a beneficiary of white privilege. "I have to be educated and learn to dismantle all the obstacles," he said as he introduced a forum that examined racism. Five Beaverton congregations: Murray Hills Christian Church, Christ United Methodist Church, Cedar Hills United Church of Christ, Spirit of Grace and Southminster Presbyterian, hosted a panel discussion featuring speakers JoAnn Hardesty, Portland Chapter NAACP president, and Ibrahim Mubarak, an advocate for the rights of unhoused people. "What Happened to the Dream?" or "The Siege of the Dream" or "What Can We Do to Restore the Sabotaged Dream?" 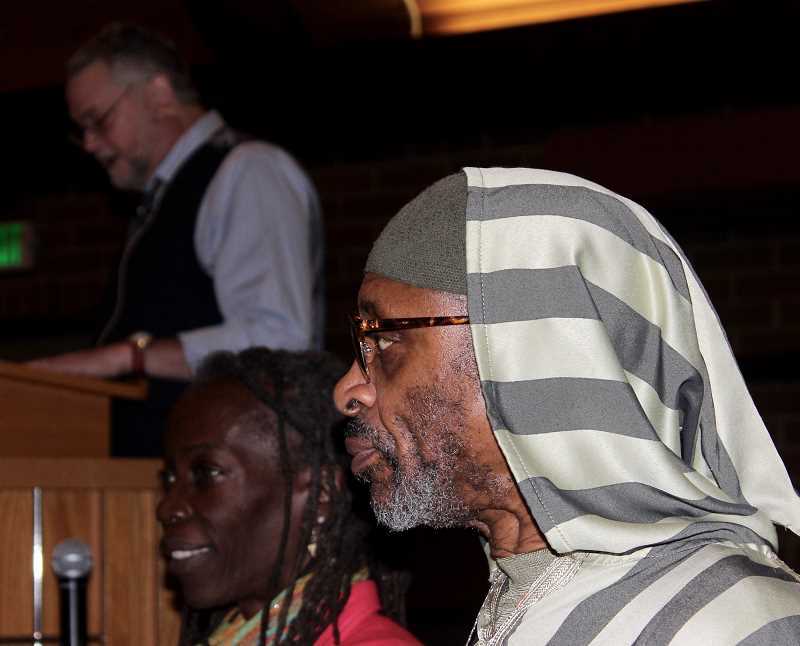 are all working titles for the discussion on race that took place Tuesday at Southminster Presbyterian. Hardesty thanked the crowd of about 50 attendees. "A conversation about race was important enough for you to leave your house this evening," she said. "Living through the last presidential election burst your illusion that racism was gone. We weren't surprised by the hatred or otherness. It's part of our experience." Hardesty, who campaigns for police accountability and racial and economic justice, told the audience it was obvious that racism has always been present. "What happened after Barack Obama became president? Right after, the Tea Party and armed white men showed up at town hall meetings. The scab has been broken off and the reality of who we are as a people has been exposed," she said. She pointed out that, in the wake of the Donald Trump election, all kinds of people of goodwill stepped up to part of something bigger than themselves. Hardesty asked the audience to not just be supportive of equality, but to also be loud and vocal about it. She said race is an uncomfortable conversation for people in the Pacific Northwest, where people are "taught to be polite in the extreme." Organizers of the event wanted to create an opportunity for suburban residents to interact with leading activists in Portland to talk about issues facing the Portland metro area in regard to diversity, race, privilege, housing, policing, gentrification and economic justice. Mubarak has been involved in the houseless community in Portland for more than 15 years and is a co-founder of Dignity Village, Right to Survive, and Right 2 Dream Too. He said once people fall down on their luck they are at the bottom of the totem pole, and it is exponentially more challenging for people of color to get back up. "We are forgetting our humanitarian spirit. We are becoming a selfish individual nation," Mubarak said. "We are failing at helping each other, so I decided to use my education and knowledge." He said he reached down into his spirituality and became an instrument of God. During a question-and-answer session, an audience member asked, "What is one thing you wish white people would do?" Mubarak responded that he wished they would bring prayer back to school. Hardesty disagreed with him and said she appreciates the separation of church and state, but she wishes white people would "challenge the narrative." "Question police officers, government officials and the media," she said. Packets titled "I Can Fix It!" were handed out at the forum that addressed what people can do to end racism. Shuck closed out by saying this was just the beginning of an ongoing discussion.